IRCTC (Indian Railway Catering and Tourism Corporation Limited) this is the official website of Indian railway where you can book rail ticket. You can also do things like food order, coach booking, wheel chair booking along with ticket booking. 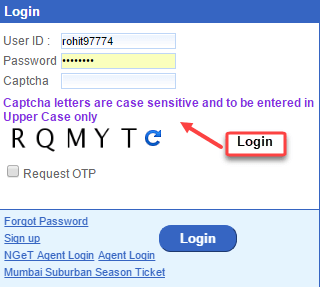 On IRCTC anyone can book online by creating free account, you do not need contact agent. You can book your ticket yourself on your smartphone or PC. Today i will show you how to book a train ticket on IRCTC, so if you are still have book ticket through Agent can do this work themselves. 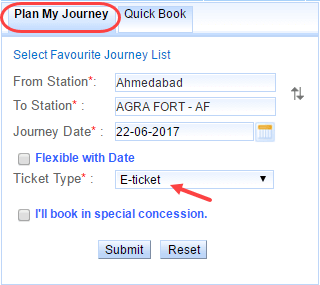 How to Train Ticket Book on IRCTC? First you have to create your account on IRCTC. Creating an account is very easy, just like you register account in other sites. Visit IRCTC’s signup page to register. In signup page fill all necessary details. Set your User ID and Password in something like this that you remember. After registering, you become the official user of IRCTC and you can login to your account and book your train ticket online. So you are planning to go somewhere with the family, and have fix that this time you have to travel by train. Then let’s book the ticket. If you want a confirmation ticket, then book your ticket just a month ago so that you do not have trouble later. Otherwise you will face seat availability issues. The first thing to do after logging in is to search the train. To search the train, you can see Plan My Journey on the right. From Station: Select your departure station here. Just enter 3-4 character of you station name and you will see your station name in the list, select your station. Here i selected Ahmadabad station. To Station: Select your Arrival station, i’m going to Agra so i select Agra fort station. Journey date: Select your date of journey. Ticket Type: Here you have to select E-ticket option. 2 Now you can see the list of available trains on the screen which will bring you to your destination. You can see all the details of the train, what is the number, when it comes, what is timing. In available train list, first select train and now select your class like 2AC (2nd class AC), 3AC (3rd class AC) or SL (Sleeper). Decide which class you want to book and click on Class (2A, 3A, Sleeper) in Class section. 3 As soon as you click on the class, you can see available booking of selected train and class. If available then it is a good thing and if it is in Waiting, then see the next date maybe it is available. If Seat is available, then click on Book Now. 4 Now in the next screen you have to add passenger details, in which you have to enter their name, Age, gender. If someone is below 5 years, then you can enter his/her name in children below 5 years column. In the Berth preference you can choose the seat of your choice, which includes upper, lower, middle, side lower, side upper. After adding passenger details and selecting your berth, enter your mobile number and click Next. 5 Now in the next screen you can see your total fare charges, you can see how much you have to pay. You can use several payment methods like NetBanking, Debit Card, Wallets to pay. Just pay and your Ticket is booked. Train ticket has been booked, now take print-out of your E-ticket. To take the print of your e-ticket, first download your E-ticket. On IRCTC account home page you can see the option of print ticket, you have to click on it. Just download that e-ticket and print out it. So in this way you can book your train ticket online on IRCTC, without any agent or extra charges. In fact, you should do all this work yourself, if you don’t know how to book train ticket on IRCTC and visit agents to book your ticket then you have to pay extra money. So learn and do this work yourself.